Holding an open house is a fun and effective way to raise your spa or clinic’s profile and generate interest among existing clients and new prospects. There is simply no better way to market the services, staff, and facilities of your spa, than by showcasing them at a live event. Open houses make customers feel like valued VIPs and enable you to forge more personal bonds with your patients. In an increasingly impersonal world, the personal touch is critical to cultivating trust and nurturing long-term relationships with patients that, in turn, reward you with lifetime value. Never thrown an open house before and are slightly daunted by the prospect? Fear not. We’ve compiled a list of our ten top tips to ensure your next open house event is a raging success that results in conversions and increased visibility for you. 1Focus your evening around a trending theme. Med spa open houses that are marketed in a general, vague way will probably receive a corresponding level of interest from clients — general and vague. Med spas that seize upon one trending issue or theme and create an event around it are much more likely to generate a real response and more excitement. If you’ve just bought a new CoolSculpting or Sculptra machine, organize your open house around your clinic’s body sculpting treatment options. If you’ve recently welcomed a new staff member with a specialization in laser skin resurfacing, create an open house themed around laser treatments for skin rejuvenation. A new treatment in your field that is trending represents another catchy thematic option. Pick a theme, be specific, and offer deals, giveaways, talks, live demos (if feasible), and brief one-on-one consultations oriented around that theme. If you’re still stuck for a theme, create an Instagram or Facebook post asking your patients to comment on procedures or techniques they’d like to learn more about. Scan the comments, and pick whatever pops out as the most notable or more frequently mentioned theme. 2Make it a party your clients want to to attend. Your event must be relevant and hip so that you attract influencers, movers and shakers who will repost the event to their friends and followers, and send live tweets from the event. Choose sophisticated virgin cocktails or wine, and enticing nibbles that are on trend — think raw, vegan, ketogenic, organic. Ask a popular local eatery to cater your event; they might offer a discount if you allow them to leave their business cards or promote their food on the event marketing. Make the open house offerings unmissable: offer great deals for purchases made that night, generous giveaways, personalized skin analyses, or fascinating live demos (NB: med spa customers love a live demo). Lastly, give your event a creative or inviting name that instantly catches the reader’s attention. 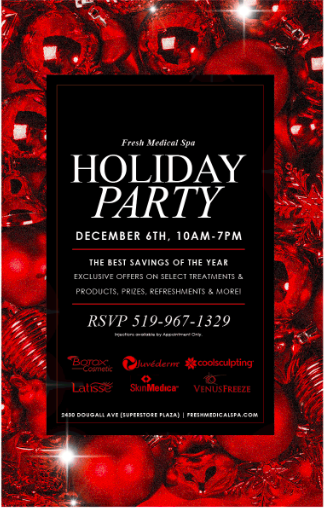 Take a look at this invitation from Fresh Medical Spa, festively named, simple, and sophisticated. 3Pick a Wednesday or Thursday to host your event. Be strategic about the day you host your open house event. Guests are more inclined to attend events on a Wednesday or Thursday as the end of the week is approaching, and less likely to come on Fridays or Saturdays as they’re liable to have other social engagements. Monday and Tuesday are usually too early in the work week to generate a large turnout. 4Have plenty of staff on hand. Use your open house as a chance to showcase your amazing staff. Friendly, knowledgeable staff who are available to answer questions, educate, and reach out to potential prospects are crucial to the success of any open house, and also transmit the culture of your clinic (i.e. comfortable and friendly, as opposed to highbrow and exclusive). Another benefit of having plenty of staff present is that they are the perfect candidates for live demos of the treatments you are highlighting during the evening. Patients LOVE to see live demonstrations because they take an unknown or unfamiliar procedure, and demystify it. Live demos result in more bookings: be sure to schedule them into your event and inform patients of the demos they can expect to see that evening. 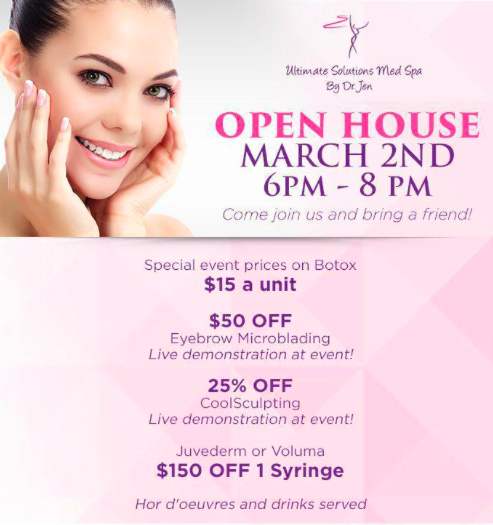 Check out this example below from Ultimate Solutions Med Spa: live demonstrations of microblading and CoolSculpting are offered, along with significant discounts for each treatment. The little details make all the difference. An invitation to a special event, and one that’s desirable to attend, should feel exclusive and personal. While posting the event on social media is fair game, it conveys impersonality. If you really want to encourage your regulars, VIPs, and key social media influencers to attend, a hand-delivered invitation is the way to go. Design a beautiful, simple invitation, highlight the importance of their presence at the event, detail the benefits of attending, and deliver it to them in an envelope addressed with their name the next time they receive a treatment at the clinic. Patients love to be recognized as appreciated individuals. 6Promotion of your event AND of your clinic. Strategic, intelligent promotion of your open house is critical. Open houses require substantial planning, collaboration with sponsors, and financial investment. Without proper marketing and promotion of your event, however, you are unlikely to reap the benefits of your hard work. To market your event, create a stunning, engaging invitation that can be printed and placed in your clinic, posted to social media, or given to patients as part of their post-care instructions. Outsource the design to a graphic designer if necessary: a less-than-professional invitation will fail to impress potential attendees. Once you’ve revealed the event, make your customers aware of why they can’t miss the open house: mention generous prizes from sponsors, live demos, and specials available only on the night. Use Twitter, Facebook, LinkedIn, and Instagram to raise awareness of the event, and as the date draws nearer, increase the number of posts and blasts. Promotion also means marketing your clinic’s services during the event. Chances are, many of your clients or new potential clients are unaware of the breadth of treatments you offer, so take advantage of your open house to raise awareness among your guests. During the event, show videos of the range of treatments you offer playing in a loop. 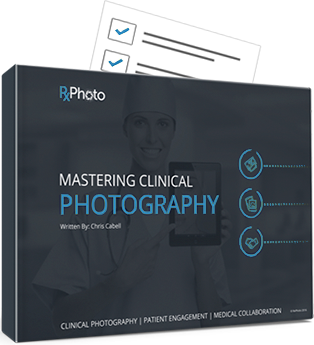 RxPhoto’s Education Center can help create this video using your own video footage or educational material provided. Place iPads around the clinic during the event to allow attendees to explore your before and after galleries; RxPhoto’s kiosk mode makes this incredibly easy and is user-friendly. The RxPhoto Consultation Center is like having another employee educating your clients on the procedures you offer. The influencer marketing industry is moving in leaps and bounds. For med spa brands looking to grow their audience and improve sales through social media, influencer marketing has the organic potential to reach tens of thousands of receptive customers. Adweek reports that the influencer marketing industry on Instagram was valued at more than $570 million in 2016 alone. 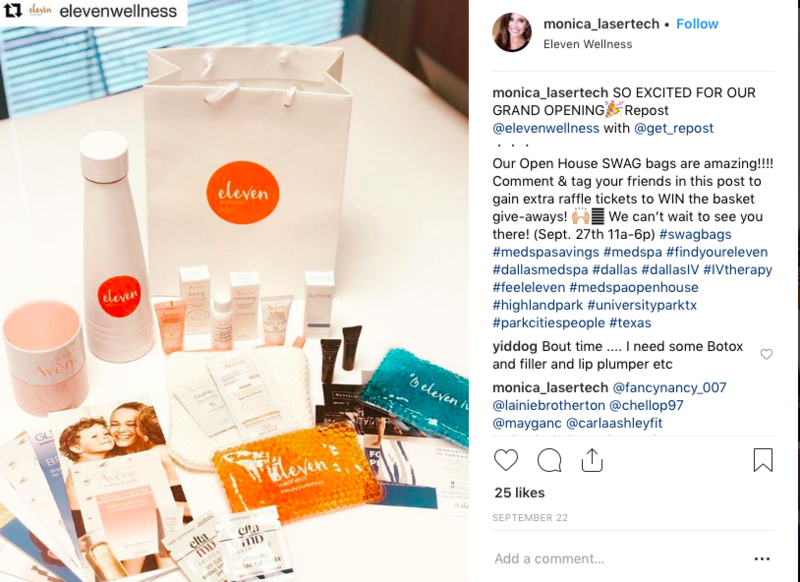 Chances are, your clinic or spa already has local micro-influencers following you on Instagram or Twitter: micro-influencers have between 1,000 and 100,000 followers. Sift through your social media platforms and check to see who’s commenting and sharing your content. You could also consider adding value to their next treatment by gifting them an extra service. If your clinic doesn’t have any influencers, find some. Use Scrunch to find local micro-influencers with great, relevant content, and reach out to them. Ash Lee of Aura MD Body explains that holding a combined event can represent a dynamic way to grow your own business and support a complementary local business. Everyone loves something for free. Raffles, giveaways, and door prizes are powerful crowd-pullers, and can be donated by sponsors or reps who stock their products at your clinic. Goody bags are also very enticing, particularly when they’re filled with vouchers for discounts or mini-treatments, travel-sized products or luxurious chocolates. Discounted packages tied to your open house theme are also powerful drawing cards; patients love knowing they are getting great value. Dr. Jakleen Labbad of Revital Derma notes that for her most recent open house, freebies and specials were distributed to great effect. 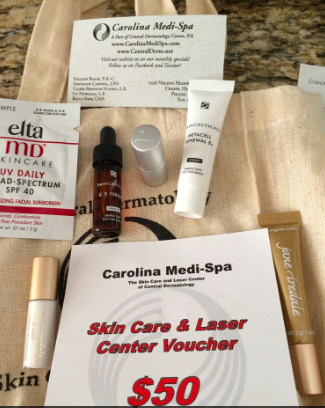 Take a look inside this goody bag from Carolina Medi-Spa posted by a very satisfied patient on Yelp: the bag contains an impressive range of treats including vouchers, samples, and chocolates (according to the patient’s post, already consumed). Generous goody bags earn you free publicity. Make a list at the door to record the names, emails, and (optional) phone numbers of all attendees. Get your front desk team to follow up on their experience a few days after the event by offering them a range of specials, packages, or value add-ons for their next visit. SMS marketing is proving to offer powerful ROI in the aesthetics sphere, with more than 90% of texts read within three minutes. As a comparison, only 10% of marketing emails are read. Text campaigns are extremely cost-effective — costing as little as one cent per message. Send an SMS to those who have provided a phone number, but be judicious — some people find marketing texts invasive, so keep the message brief, friendly, and polite, highlighting the post-event specials being offered. The final word on successful open house events. Open houses allow you to creatively market your med spa or aesthetic clinic in a way your guests will love. Well-planned and executed events raise your profile both in your local community and on social media, and result in conversions and increased revenue, improving your bottom line. Moreover, open houses provide you with a chance to make your customers feel valued and promote long-lasting relationships that guarantee you a lifetime of value. Be original in your vision and create an open house event you feel passionate about — it will reflect in your post-event feedback and sales.